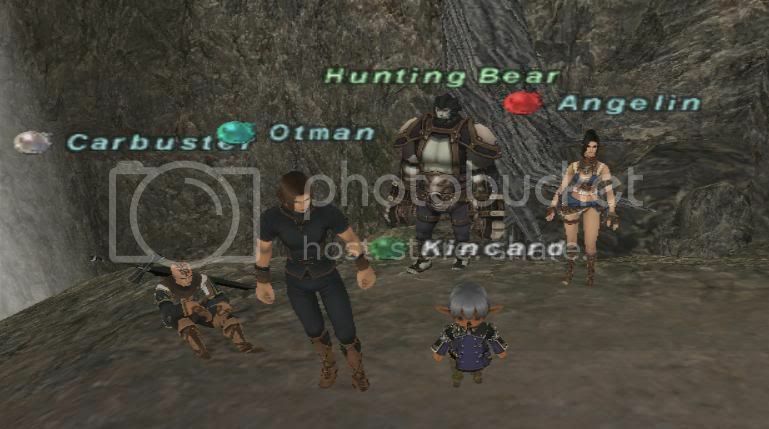 Multiplayer RPGs / Re: Final Fantasy XI - Journal! This is a good page for basic questions like that. Yeah, costs quite a bit of gil though (At least for noobies), from 10k-30k I believe, depending on the weekly rank of the nation you wish to transfer to. You also lose your CP (Kind of, your CP is saved on each individual nation, which makes sense). And with mission 2-3, even if I switch to Windurst, we can do it together as long as we end up going to the cutscenes in the right order. Rank 1 and 2 missions are easily soloable at your level I believe, but 2-3 gets a level 25 cap. All the missions from rank 3 to rank 6 are the same, as I recall. It would work very well in duo/trio situations I would guess, especially if you plan on keep playing with Parn or your friends. 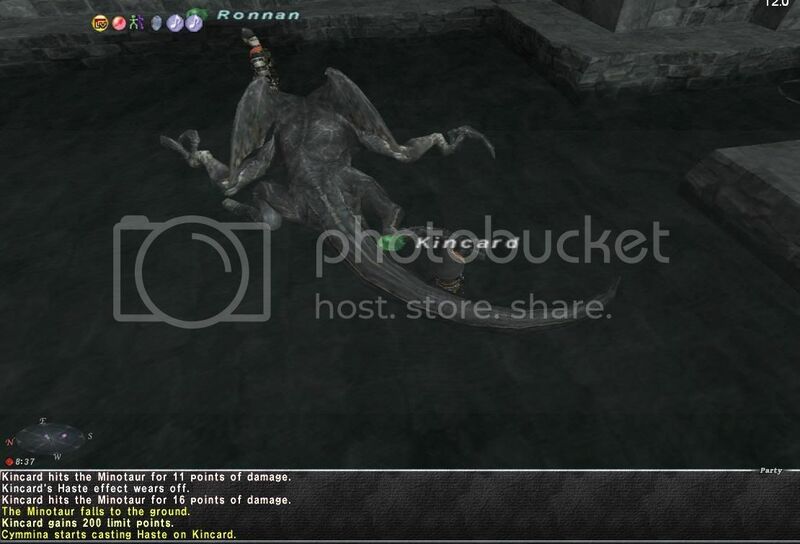 Otherwise, people on FFXI are douches when it comes to subjobs. And I suppose if you plan on playing without raises, you can buy some Reraise Earrings/get reraise scroll with CP if you want some extra insurance. 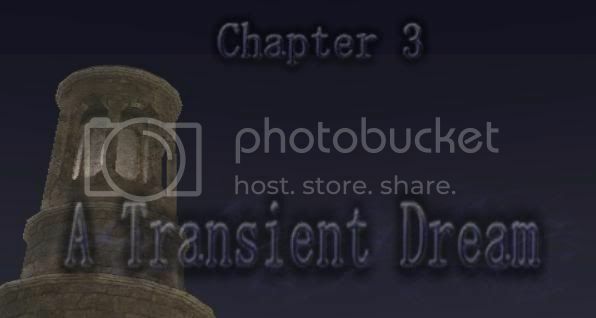 EDIT: Speaking of all you low level guys, I assume some of you would want to go for rank 3 sometime...I might decide to change nations sometime soon so I can get in on a storyline (Most likely Windurst). I would recommend SAM/WAR out of those two, if you play MNK the best sub would still be WAR, as DNC is considered to be a solo sub. You can sub DNC all you want solo, but it doesn't have much effectiveness in party play. Also with SAM, its nice to have THF sub as an extra once you hit high levels, but you dont need to worry about that for a long time. 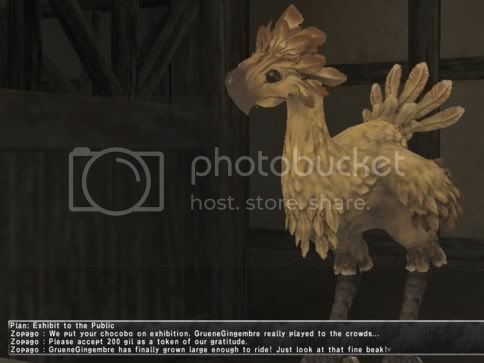 So my chocobo grew to adulthood, with a nice digging beak to make it look different from stable chocobos (Well actually its because I've only been working on mental stats), but nevertheless I retired her, I think I'd rather go for a more exotic color. As we speak, it is making sweet love with a black chocobo. Let's see if I get luckier next time! Since we had ToD on Dobsonfly, we went again this afternoon (Or evening, if you're in the States). I ended up picking up this thing, though I feel a bit guilty since I ended up being the only guy to lot on it from overflowing of items in the treasure pool. I've heard that its a great piece, but I didn't know much of what it was good for outside of WSing, so keeping in mind it would bring upon epic rage, I decided to ask the party. Well time for a decent-sized update. Recently did the Tour of Gustaberg quest. I had to delevel my BST from level 6 to 5, but I'm glad I got this quest done before I had no chance in hell of doing it. Sky this weekend was pretty uneventful, we wanted to do Kirin but we didn't have enough people. I got a shiny new helm for my...uh...level 30 PLD? But the biggest thing that's been happening is CoP. I'm excited as hell because today I did the first mission advancement in CoP i've done in like, a year and a half. CoP's story is getting real interesting, personally so far I already find it more interesting than RoZ and ToAU combined. RoZ's story was a snore, and ToAU's was filled with lots of meaningless exposition. This one seems to have more interesting characters and stories for characters we've already grown to know. Well I finally started doing some stuff in CoP with Cymmina, Mercilessturtle and Levit. It's not the mission I'm on, but it was pretty fun. I /search you every time I get on...I can never seem to catch you on, heh. Anyway, got MNK to level 21. 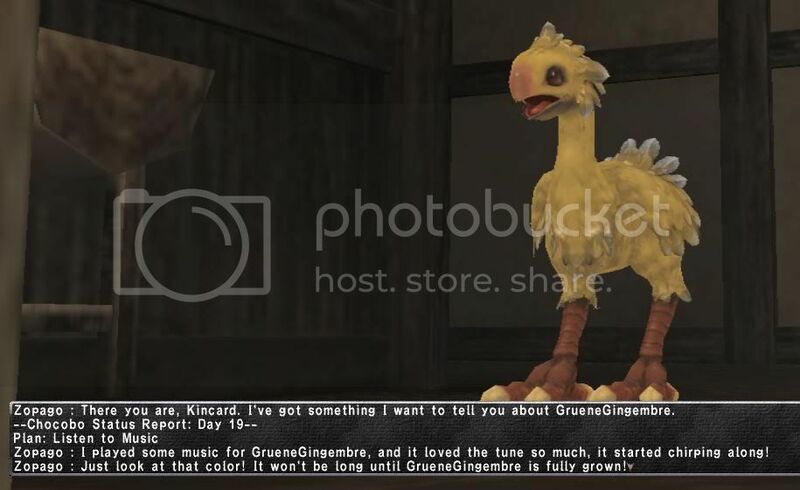 Named my chocobo in true FFXI alliteration fashion- GrueneGingembre. Yeah, it's in one word like that, kind of annoying that they do that. 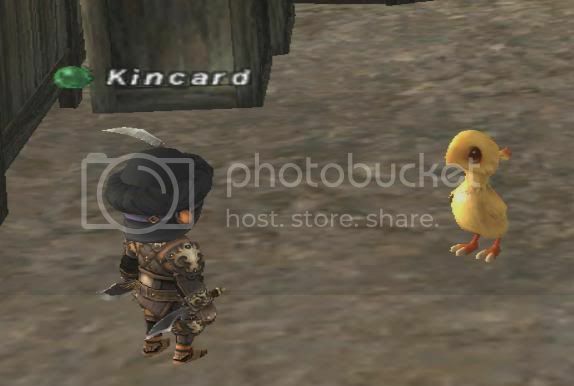 Not much to say about my chocobo, still trying to decide on a name. I want to use my assault tags for something, they've been rotting for a while now, and it'd be nice to do some assaults, Nyzul or not- though it'd be nice to get myself a Nyzul katana so I can learn Blade: Kamu. Then again, I don't think I want to go get 5250 WS points or whatever the hell was required. 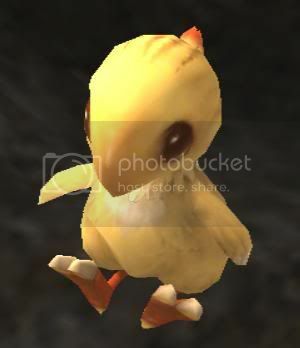 In other news, I've been doing some more laid-back stuff in game, most notably chocobo raising. I'm surprised at how much fun I'm having with it, guess I should've done it sooner. The Ninja one did not transfer properly onto dat-scanning programs. It's actually supposed to be the Ninja disappear, appears for a split second with the blade sticking out, and then reappear in their battle stance. So it's like a one-hit Blade: Ku...with a WS effect that looks pretty meh in comparison. Saw them a few months ago on a JP site, RDM one is still my favorite. I just like how it actually is supposed to be something rather than just a random mish-mash of flashy lights. I, too, would like to start leveling a new lowbie job now that my THF is at 75. Seeing as how I have a tank and a utility job, I suppose I should play a focused DD or a support job to round myself off. Thinking between WAR, BRD, COR, and RDM. 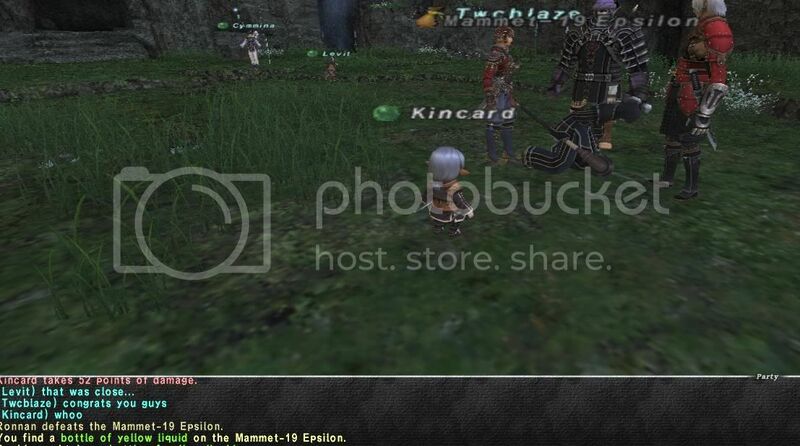 Multiplayer RPGs / Final Fantasy XI - Journal! I hardly see how this is a little change at all- keep in mind that they're developing this change with the specific target of making finding partying for GRINDING easier. Whether or not its going to be good for missions is yet to be seen, I suppose. Have you played a job at mid-levels recently? It's really barren out there...at least on most servers anyway. Not needing to wait for 2 or 3 hours for people to log in? Yes, that's a good thing. They did say that gear for that level will still be the best (At least they'll work towards that), but for me, I think I'll take slightly lower xp/hour for being able to basically play any job with my friends anytime I want. With friends its also easier to get them to go play in more exotic areas of the map...something that's really bothered me since day 1. And let's assume that they REALLY screw up and scaling equipment makes overleveled equipment totally useless...this is still a very useful thing to have. As far as xping goes, this is the best thing they could've added. I honestly can't think of any downsides to this. Scaling equipment is nice because it's just plain annoying to get level-appropriate gear between the steep cost of some of them, and more importantly, the limited inventory space of the game. With level-cap missions and quests...really, how often have you seen people go out and buy say, a PCC just to do those things? The scaled level 75 equip (With appropriate mods) will not be much worse than the cheapest gear available people randomly buy off the auction house the day of the run. Another thing to keep in mind with that is the fact that the majority of key-piece level cap gear are staple things for most players to have on-hand anyway. SH is level 57, Haubergeon is 59, list goes on. 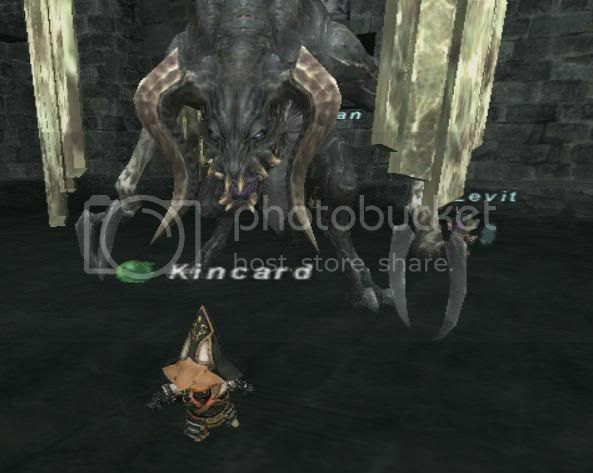 In fact, a crapload of it will most likely be BETTER if they do linear scaling. Example: Promyvion. If I take in some of my best stat mod pieces, this is I'll end up with (Anything I don't list isn't worth mentioning probably). Also for someone who's played as long as I have, I have to say my gear is at best above average (Save maybe a few pieces like Osode and Haidate). Only exception I can possibly think of that can't benefit from these stats under level caps are Paladins at the lower level caps where Defense is still worth a damn.